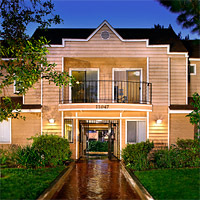 Strathern Park East is a 25-unit affordable housing property located in Sun Valley, CA adjacent to our larger Strathern Park community. The waiting list is currently closed. Each unit includes a full kitchen, central heating and air conditioning, carpet, vinyl, window blinds, a patio or balcony, smoke detectors and fire sprinklers. Strathern Park East is a controlled access building with intercom entry and gated parking. The property features a laundry facility, gym, computer learning center with internet access, three playgrounds, two basketball courts, two large outdoor courtyards, and a community garden. A variety of resident activities are offered including an after-school homework club, movie afternoons, art classes, and monthly parties. Strathern Park East is conveniently located near a public park, retail centers, banks, major bus and train routes, grocery stores, and restaurants.